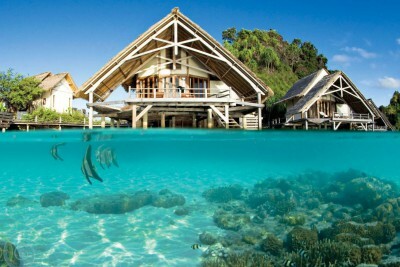 The most easterly and one of the least populated provinces of Indonesia, the main attraction for visitors to West Papua, formerly known as Irian Jaya, are the stunning, remote islands of Raja Ampat. There are over 600 islands in total, the four main ones being Waigeo, Batanta, Salawati and Misool. The diving in Raja Ampat, located within the famous Coral Triangle, is world class having 75% (550) of the world’s coral species. It has probably the richest marine biodiversity in the world, with an estimated 1427 species of fish, plus 60 species of crayfish, five squid and 699 species of mollusc. As well as the abundant macro life, there are frequent sighting of manta rays and sharks, including the curious looking wobbegong. On land, the scenic mountains and forests are home to mammals and many birds including the yellow-crested white cockatoo, forest kingfisher, julang Irian, king parrot, red-black-headed parrot, manbruk Viktoria, cassowary and various birds of paradise. The South Misool nature reserve, for example, has 159 species of bird including 4 birds of paradise. The main point of entry is Sorong, with regular flights from Manado, Makassar, Bali and Jakarta making it easy to combine with others parts of Indonesia. West Papua has the opposite weather pattern to the rest of Indonesia, being driest from October to April and wettest from May to September. The seasons are much less marked here and the various micro-climates around the islands mean that you should expect sunshine and showers throughout the year.